If you are reading this because you already have a medlar tree and are seeking help to grow it well, then feel free to skip past the introduction section and go straight to the cultivation section of this document. 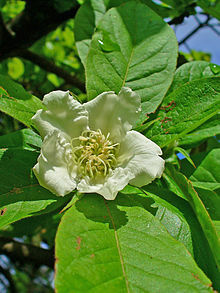 For those thinking about growing a medlar tree, congratulations, we can give you several reasons for doing just that. Many articles on medlar trees appear to view them as mysterious trees from an age before time began. Our research however dates the common apple tree to earlier than the medlar tree. In truth non-one knows how far back they date but many other fruits and plants date back just as far. It produces an edible fruit - that may not sound so astonishing but just think how many trees have no edible parts. As far as I know, none of the supermarkets sell medlar fruit. Nor have I ever seen any for sale elsewhere except once in a farmer's market. If you grow a medlar tree in your garden and eat the fruit you will be a member of a very small and select part of the UK population which has ever tasted them. Just imagine, next time you are down at the pub and someone asks what you've been up to today, you could be able respond with "harvesting my medlar fruit"! Sounds silly maybe, but I guarantee you this, the conversation will not stop there. A far better response to the question compared to "down Sainsbury's with the wife doing the week's shopping" - now that really is a boring way to spend a few hours. To get back to to the "mysterious tree" idea mentioned at the top of this article. Granted, apple trees go back just as far as medlar trees, who knows, maybe even further. The fact is though, that medlar trees are mysterious because the fruit looks like it has just landed from Mars. Combine this with the fact that most people wouldn't know a medlar fruit if it stared at them and you do have something unknown and rather mysterious ...... exactly what did those Victorians and Edwardians do with the fruit? The form and size of a medlar tree is within the bounds of most gardens. The tree bark and branches begin to look old and interesting after only a few years. The have very attractive flowers in May time. Medlar trees are extremely healthy and very rarely suffer from pests or diseases. They are probably best left unpruned. This is an extremely low maintenance tree. The fruit can be eaten raw or used to make jellies. Those of you past the age of forty may well have realised that quality is far more important than quantity. The medlar tree will provide you with an exclusive tasting fruit which has a definite rarity value. If you grow a medlar tree on its own roots it will grow to about 7m / 23ft tall and about the same width. This is too large for most gardens so all medlar trees sold in the UK are grafted onto dwarfing rootstock. The rootstock is the lower part of the tree and will be dwarfing - either quince or hawthorn. The upper part of the tree is a medlar. The rootstock will be responsible to a large degree for the overall size of the tree. Normally, grafted medlar trees grow to a height of 3m / 10ft and a width of 4m / 13ft, a very nice size for many gardens. You can basically treat your medlar tree exactly as for apple trees with a few exceptions listed now. Medlar trees are in general problem free and once established require absolutely no attention. They will require staking for the first three years but then will be able to support themselves. They don't need pruning although it's fine to do that if you want to keep them in shape. Prune when they are dormant in mid-winter. Medlar trees are fully self-fertile and one tree will quite happily produce fruit on its own. Medlar fruit will be produced on three to four year old trees and and cropping will be at its maximum on a five to six year old tree. All medlar trees are deciduous (loose their leaves in winter). They grow equally well in full sunshine and partial shade, their particular dislike is water-logged positions. If the fruit is to be used for making jellies, ideal with rustic cheeses, it can be picked in early November when it will be tart. 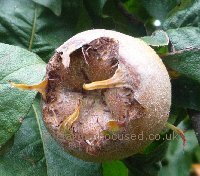 A good recipe for medlar jelly can be found here. Different recipes require the medlar fruits to be at different stages of ripeness. One rather misconceived recipe requires some of the medlarfruits to be ripe and some of them to be hard and unripe - not quite sure at what time of the year you can get hold of the two at the same time. Maybe half in Scotland and half in Devon! For eating by themselves the fruits need to fully ripen until they are soft which will be around mid-November time, the first frost is normally a good time to harvest. This last period of ripening is called bletting for some reason, for us it's just ripening. If you are out in the garden frequently at that time of year just pick the fruits direct from the tree and eat them then and there as a daily treat. If you need to store some then simply pick them and store in a cool area (shed, garage etc.). They will last for another three to four weeks or so. The colder it is the quicker they will soften. Click on the picture above to buy the Nottingham medlar tree from our recommended suppliers of this tree, Victoriana Nursery. We have negotiated a 10% discount on everything you buy from them which will be automatically applied at their checkout. One of the easiest medlar trees to buy because it has several good qualities. First, the fruits are probably the best tasting of all the medlar fruits, on the small size but very tasty. Use is for eating and for making jellies. The fruits taste of pears and apples with a runny toffee consistency. The trees grow to about 4m wide by 3m high when grown on Quince A rootstock making them an ideal size for most gardens. For eating pick the fruit in late October and then store (see above) for about 3 weeks before eating. Not quite as popular as the Nottingham variety but still a very worthy tree. The fruits taste slightly of figs, a very acquired taste although they make excellent jellies.